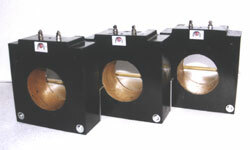 Stemar manufactures and supplies cast resin current transformers for use on systems upto 36kv for both metering and protection applications. Current transformers can be supplied for both internal and outdoor applications, for internal applications a standard epoxy resin is used however for outdoor applications transformers are cast in UV stabilised cycloaliphatic resin. All Cts are of compact design, with high mechanical and dielectric strength, using nonhygroscopic and non hazardous materials. Please provide as much information as possible to assist in the design process.